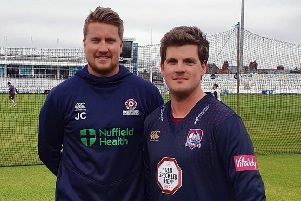 Northants head coach David Ripley admitted it was a case of so near and yet so far as the Steelbacks were dumped out of the Royal London One Day Cup by Worcestershire on Sunday. The 34-run defeat at New Road means the Steelbacks cannot qualify for the knockout stages of the competition, even though they still have one group game to play, at Yorkshire on Thursday. Ripley was understandably disappointed by his team’s defeat and exit, but felt ‘more enthused’ by aspects of his team’s performance than he has been in previous disappointing defeats in the competition. Australian Callum Ferguson was the star of the show for Worcester on Sunday, smashing a brilliant 159 not out from just 135 balls, while Joe Clarke creamed a damaging 122 from 117 as the pair put on 239 for the second wicket to ensure Worcester posted a hefty 348 for five in their 50 overs. Northants then made a decent effort with the bat, and were up with the run-rate for most of their innings, but they fell short as they were bowled out for 314 with two balls of their innings to spare. Adam Rossington (63), Robert Newton (61) and Rob Keogh (51) all made half-centuries, but nobody went on to make the big score to see the County over the line, and Ripley was left to rue lapses at crucial stages with both bat and ball. “I think at stages we threatened,” said Ripley. “It’s a lot of runs to find and you can’t afford to have a bad five or six overs but that is what cost us. “We were ahead of them at the half-way stage after the 25 over mark, but in their innings their two guys (Clarke and Ferguson) then went up a gear and we didn’t respond well to that. “I thought we leaked 25 runs too many in that period. “In reply we were reasonably well placed and all the top five scored more than a run a ball, but Callum Ferguson’s run a ball 160, that unfortunately is where we came in short (in no-one going onto make a big score). Ferguson’s performance came off the back of the 192 he scored on his New Road debut against Leicestershire last week, and his fellow centurian Clarke has been mightily impressed by his new team-mate. “I’ve got two List A hundreds for Worcestershire now and I would say that was probably my better one, but when you are batting with Fergie (Callum Ferguson) at the other end, he makes it easy,” said Clarke. “We have enjoyed batting together over the last couple of games here and that partnership today proved to be a crucial one and it was a special knock from him. “He has got a calm head and has played a lot of one-day cricket and he brings that calmness to the batting side.